The NFL is marching on toward its quarter pole, which means we have the unfortunate pleasure to experience bye weeks and international games starting in week 4. No need to fear however, Prime Time Fantasy Football never takes a bye week, and we’re made right here in the good ole’ U.S. of A! 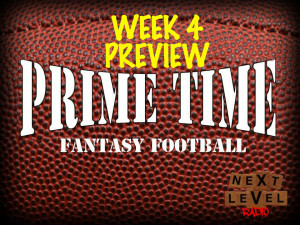 We will yet again answer some listener questions to kick off the Week 4 preview show of Prime Time. This time around we have two, two-parter questions, so plenty of your inquiries to get to. Then we’ll do something rare for this show, and any fantasy football show in 2015 really — we’ll talk tight ends! Gronk is out this week, so make sure you have a good bye week fill-in by listening to us. We also got some great feedback regarding our format of covering every game throughout the NFL, so we discuss all 15 contests for Week 4 (Feel free to keep that positive feedback coming, by the way). Finally, we’ll close as we always do with some Show Me the Money and a Fantasy Fact of the Week.